HomeTechnology5 best Pokémon Go IV calculators for Android! Pokémon Go IV calculators are a powerful resource for trainers. Your Pokémon’s IV determine its strength, competency in battle, and overall CP. The higher the IV, the more powerful the Pokémon. There are a variety of ways to calculate IV. However, there is also a caveat. Some IV checkers break the Pokémon Go terms of service. Thankfully, there are plenty of legal options out there. They usually just require a little extra work. Here are the best Pokémon Go IV checkers that are also totally legal! From what we can tell, there are a few easy ways to determine if an IV checker or calculator is illegal. The first is whether or not its calculates or checks. IV calculators use information from the game to make educated guesses about your Pokémon’s IV. Checkers, by contrast, usually ping game servers for the exact numbers and that’s illegal. In addition, calculators never ask for our Pokémon Go login credentials while illegal checkers usually do. If you’re not sure, just stick to the IV calculators on this list! Finally, not all IV calculators are in the Play Store. IVs are basically Pokémon stats. Each species has its own set of base stats. For instance, Snorlax generally have a higher HP base than, say, a Bulbasaur. However, each Pokémon of a certain species has its own stats in comparison to others like it. Thus, almost no two Snorlax and no two Bulbasaur are the same. The IV stats determine things like attack power, defense, and stamina. These stats predominately affect things like HP growth and combat ability. In the regular Pokémon games, IVs are a huge deal. However, Pokémon Go doesn’t put as much emphasis on them, likely for the sake of enjoyment from the casual audience. That doesn’t mean IVs are useless, though. The differences in a low IV Pokémon and a high IV Pokémon can be fairly significant over the course of the level up process. In other words, it’s good to have, but you won’t have such a huge advantage that it’ll be impossible for other players to beat you. Calcy IV is among the top two or three most popular Pokémon Go IV calculators. It uses your current Pokémon’s CP, level, HP, and other metrics for its IV determination. It also supports almost every language except Traditional Chinese. It’s not hard to use. 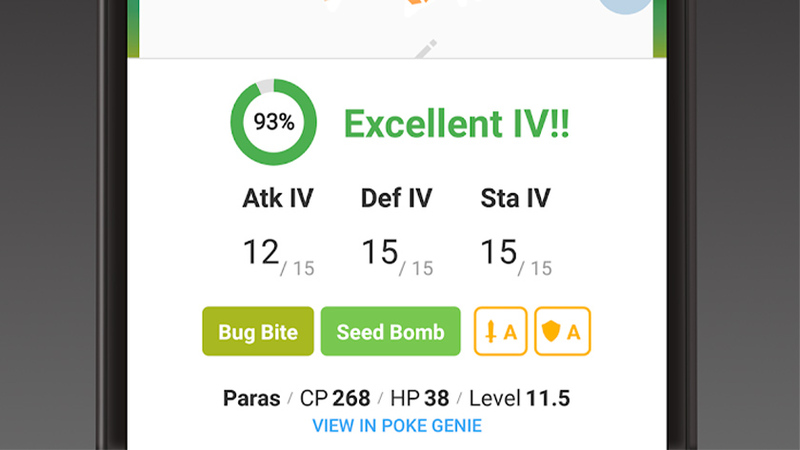 The app screenshots the game and then calculates the IV from there. The game also includes a Gym Badge progress reader, renaming features, and perfect counters for raid bosses. There is also info for weather buffs and other such things. It’s great for IV calculating, but it also has several secondary uses. It’s a good one for sure. GoIV is another popular IV calculator. However, this one spent significant time outside of the Play Store and only recently came back. It’s a free and open source solution with some decent features. It calculates IV like you would expect. In addition, it tries to predict power up stats, has a renaming function, and it can scan your Pokémon for exporting. It’s definitely an excellent time saver and its IV calculations are usually quite reliable. This one has a few bugs, but usually nothing serious and the developers keep up with the latest new Pokémon. It’s also free with no ads and completely open source. GamePress IV Calculator is a website with a manual IV calculator. That means you input all of the data yourself and it spits out an IV range. You can add stuff like the CP, HP, how much stardust to next level up, whether or not it’s hatched or lucky, and the stats feedback you can get in game. It uses this to calculate your IV with about a 10-15% degree of accuracy. It’s a bit tedious because it is manual input rather than the automatic input of other apps. However, those who don’t mind the grind can get good calculations from websites like this. Plus, they’re usually entirely free. Poke Genie is another one of the top two or three most popular Pokémon Go IV Calculators. It uses information from the screen in order to stay above board. It’s entirely legal. Plus, it has very good IV calculations. The app also includes some additional, deeper stat insights. It can also tell you if you can solo a raid or not and there is also a renaming function. The scan history shows you what Pokémon you scanned previous for future reference and there is a screenshot method in case your device doesn’t play well with screen overlays. Some have complained about data usage and performance issues. However, most people seem to really like this one. The Silph Road is a very popular website for Pokémon Go fans. It has news, a full on Pokédex, and information about various tasks, eggs, raids, and social groups. There is also a basic, but easy and effective IV calculator. It uses your trainer level, current CP, and HP to give you a very rough idea of your Pokémon’s IV calculations. You may get more precise results from other apps or websites. However, this gives you a rough idea very quickly without an extra app. The developers are working on an advanced CP calculator as well, but it’s not out yet as of the time of this writing. Enjoy! If we missed any great Pokémon IV calculators, tell us about them in the comments! You can also click here to check out all of our Pokémon Go tutorials!